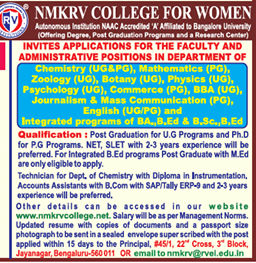 NMKRV College for Women, Bangalore has advertised in THE TIMES OF INDIA newspaper for the recruitment of Faculty job vacancies. Interested and eligible job aspirants are requested to apply with in 15 days. Check out further more details below. About College: Nagarathnamma Meda Kasturiranga Setty Rashtreeya Vidyalaya College for Women - NMKRV College for Women, managed by the Rashtreeya Sikshana Samiti Trust, Bangalore is the beautiful campus, gifted by the natural greenery and beauty. It provides a conducive and congenial environment for academic pursuits. The college that was started as a Pre-University College in 1971 with just 150 students has grown in leaps and bounds. In 1973, it was bifurcated as the NMKRV Degree College for Women. How to Apply: Candidates may send resume with copies of credentials and recent photograph by post or email with in 15 days.